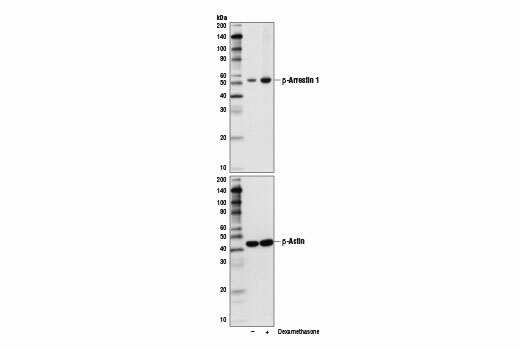 Western blot analysis of extracts from various cell lines using β-Arrestin 1 (D7Z3W) XP® Rabbit mAb (upper) and β-Actin (D6A8) Rabbit mAb #8457 (lower). Western blot analysis of extracts from A549 cells, vehicle-treated (-) or treated with dexamethasone (100 nM, 16 hr; +), using β-Arrestin 1 (D7Z3W) XP® Rabbit mAb (upper) and β-Actin (D6A8) Rabbit mAb #8457 (lower). 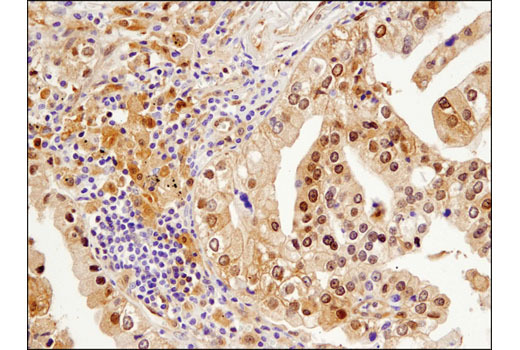 Immunohistochemical analysis of paraffin-embedded human lung carcinoma using β-Arrestin 1 (D7Z3W) XP® Rabbit mAb. 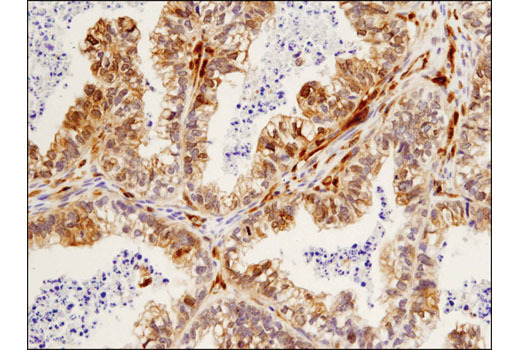 Immunohistochemical analysis of paraffin-embedded human ovarian carcinoma using β-Arrestin 1 (D7Z3W) XP® Rabbit mAb. 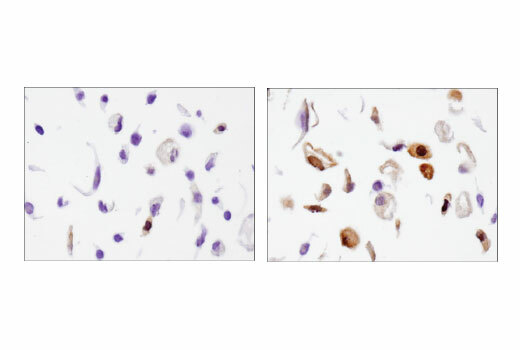 Immunohistochemical analysis of paraffin-embedded A549 cell pellets, untreated (left) or dexamethasone-treated (100nM, 16 hr; right), using β-Arrestin 1 (D7Z3W) XP® Rabbit mAb. β-Arrestin (D7Z3W) XP® Rabbit mAb recognizes endogenous levels of total β-arrestin 1 protein. 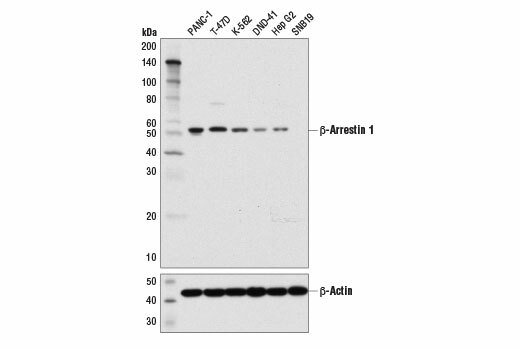 This antibody does not cross-react with other arrestin proteins. Monoclonal antibody is produced by immunizing animals with a synthetic peptide corresponding to residues surrounding Arg363 of human β-arrestin 1 protein. The non-visual β-arrestins respond to glucocorticoid signaling, with differential responses observed among family members. Specifically, β-arrestin 1 expression is increased in response to glucocorticoid receptor activation whereas β-arrestin 2 shows a concomitant decrease in expression (11).